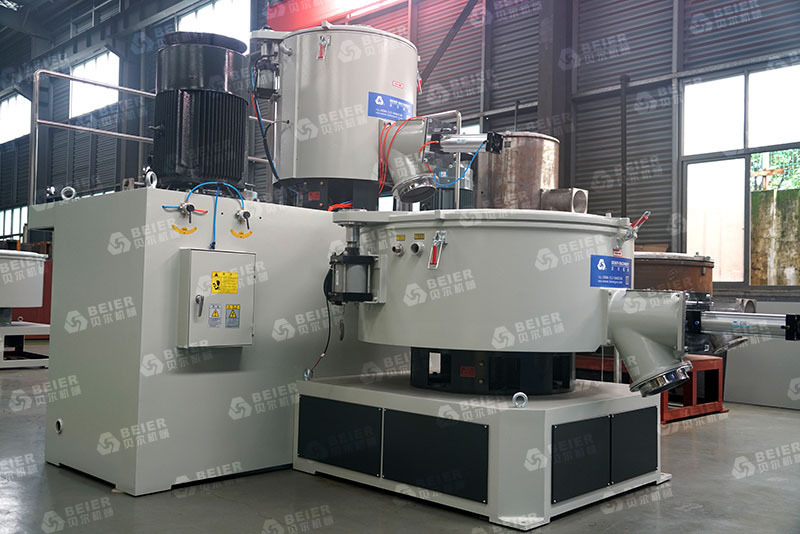 Beier Machinery PVC High Speed Mixer Machine is mainly used in mixing PVC and all kinds of plastic materials mixing, colouring, drying and etc in plastic, rubber, food-stuff, daily chemical industry and so on. Beier Machinery is high quality professional manufacturer in China. Beier Machinery is specialized in providing you with PVC High Speed Mixer Machine. The quality of PVC high speed mixer machine is reliable and the performance is stable. 1.PVC high speed mixer machine is used in mixing, drying, coloring and other processing. PVC mixer machine is the most ideal equipment for producing shaped PVC material and plastic. 2.The technology of the main shaft sealed apparatus has got the national patent with electric and steam heating functions. 3.Two layer of sealing technology is adopted in the pot cover. The opening of the heating mixed cover adopted the air opening device and the opening of the cooling mixed cover adopted hydraulic pressure control system. 4.The electrical control section with the programmable logic control adopted well-known imported meters and control components. 5.PVC High Speed Mixer Machine adopt advanced design and can be operated easily.safely and reliably.They have small size,light,weight high efficiency,low energy consumption and low noise.